Signing up for a poker account is probably a lot simpler than you think. The poker rooms have made it very quick and easy for you to set up an account, you can start playing in a matter of minutes if you want to. 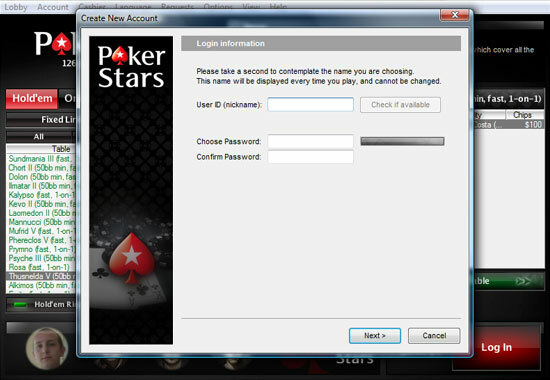 Visit PokerStars and see how easy it is to sign up for an account. When signing up for a poker account you only have to provide a small number of details such as you name, age, email address, where you live and so on. All the poker rooms expect is that you enter the correct information so that they can verify you are a legitimate user and be able to contact you about any issues that may arise between you and the poker room. This is so that the room can help keep you and your money safe at the tables, so double check that everything is correct before you finish submitting your details. If you set up your account today, you are never under any obligation to make a deposit. You can sign up to the poker rooms and never make a deposit without the fear that your account will be deleted. If you are still a little unsure or want a preview of what to expect, we have put together a step by step guide of how to sign up to the PokerStars poker room. Step 1 – Download the software. The easiest way to sign up for an account is to first download the software. Simply go to the site and a download button will be on the front page or a pop-up will appear asking you if you want to download the software. A download window will then appear which will ask you if you want to ‘Run’ or ‘Save’ the program. The easiest option is to click ‘Run’ as this will automatically start the installation when the download is complete. Step 2 – Click log-in or sign-up. 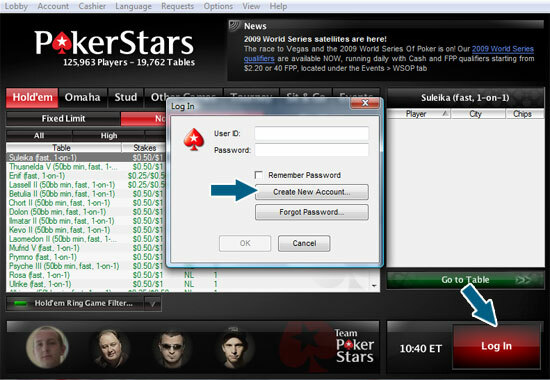 When you open up the poker software you should be able to see a ‘Sign Up’ or ‘Log In’ window or button. Clicking ‘Sign Up’ will take you to the next step, but if you only see a ‘Log In’ button, you should click this as it should offer you the option to sign up in a new window. In the PokerStars example you can see that there is a ‘Log In’ button on the main program that we need to click that opens a new window. In this new window we now need to click on ‘Create New Account’ to take us to the next step. Step 3 – Fill in your details. This is the most important part of the sign up process, as you should ensure that all of your details are correct before you proceed. Make a note of the password and username you make for this room so that you won’t forget it next time you log on. Be creative when choosing your user ID, as this is what your name will appear as at the tables. Make sure that you are happy with your choice because you will not be able to change this after the sign up is complete. The example shown below is a standard sign up form that is similar to most poker rooms, although some may ask you for more details such as a Drivers License or Passport number to verify your identity. What you may now be asked to do is to visit your email inbox and open an email that the poker room has sent you. Inside there will be details of how you can verify your account and start playing. This could either be in the form of clicking a verification link or entering a verification code at the site. Either way, it is a straightforward process that you will be guided through by the email. Note: In between signing up and confirmation you may be asked to fill in a questionnaire about how you found out about the site. This is simply so the site can find out how well its advertising campaigns are doing, and so the choice you give will not have any affect on your poker account. Well done! You should now have signed up to your first poker room. All you need to do to start playing for real money is to make a deposit via the cashier. Even if you do not wish to make a deposit yet, you can still participate in the play money games and view other people playing in the cash game tables and tournaments. You can use this time as an opportunity to get to grips with the poker room and its software so that you will be comfortable for when you start playing for real money. Finding the right poker room.